Standard Large Sliding Doors are manufactured with patented Sing Core material as the base interior substrate of the door. 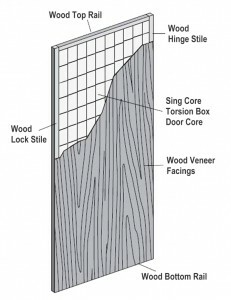 The Sing Core substrate material is created using a vertical grain natural wood torsion box design while the traditionally empty voids are bonded wall to wall with recycled foam. The foam material is available in various forms depending on your specification. The default is EPS foam. Natural wood lock blocks are positioned at locations as necessary for locking mechanism placement or as anchor points. The core material is wood framed by 1 ¾ “ natural wood for finishing strength and attaching hardware. The torsion box is completed by adhering an exterior material (skin) according to your specifications. The default is a wood-grain (Luan) material. Bonding agent used in adhesion of the entire composite material is formaldehyde-free. Every Large Sliding Door manufactured door is unfinished (unless specified otherwise) and is guaranteed for 10 years for structural integrity. Delivery: Reasonable care is taken to ensure safe transportation of your Large Sliding Door from factory to your location including proper crating to protect the natural beauty of your door during transport. 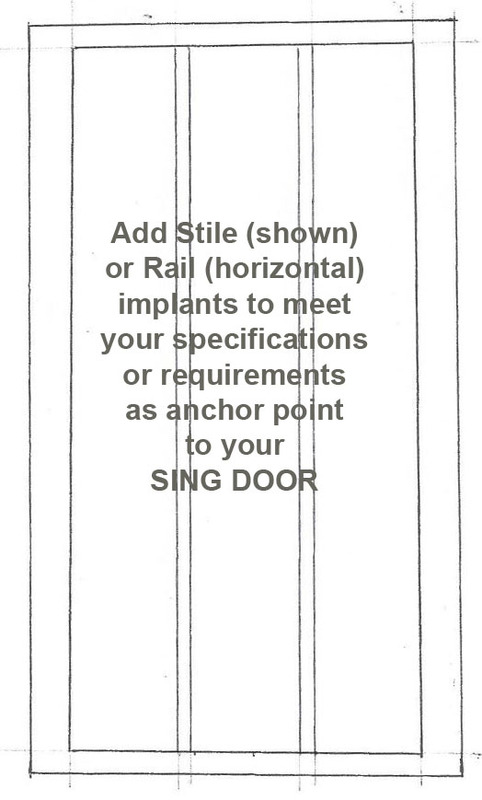 Storage and Protection: Store your Large Sliding Door in an upright position and allow to acclimate to room temperature following shipment receipt or prior to finishing or installation. Finishing: The finishing of the Large Sliding Door standard door is the responsibility of the client due to the product being delivered in paint-grade quality unless specified otherwise in writing. Any sealing must be in accordance with manufacturer’s specifications to protect against a variety of environmental conditions as necessary. Machining: Large Sliding Doors are easy to work with in the millwork shop for CNC machining or on-site for finishing, sawing, sanding, cutting and fastening. 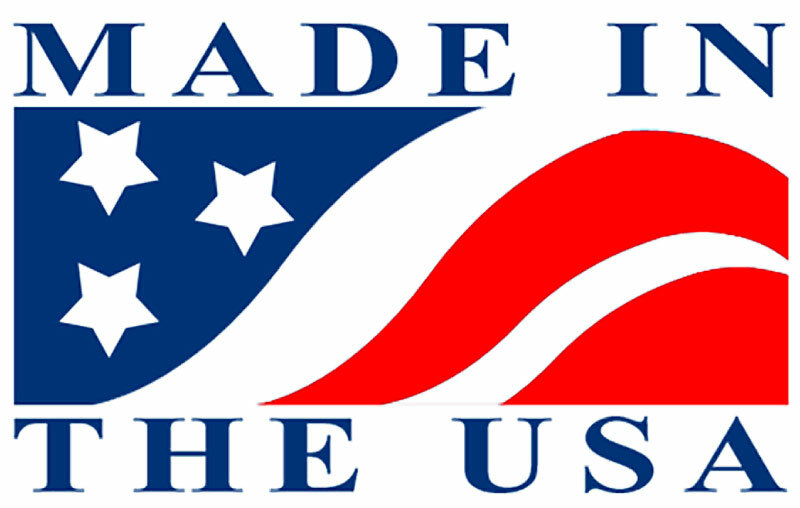 No specialized skills or equipment is necessary, other than standard woodworking tools. 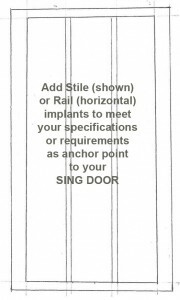 Treat Large Sliding Doors just like you would any other standard door blank. Light Weight Performance: Sing Core used in Large Sliding Doors weighs much less than other traditional building materials, as much as 50% less; or more, as little as 4 lbs. per sq. ft. yet sustainable and true green technology. Insulation Performance: Standard Large Sliding Doors feature built-in insulation value with an R3 (can be upgraded to to R6.5 or more) rating per inch, depending on architect’s specifications. Acoustical Performance: Large Sliding Door standard doors have a natural sound-deadening quality for noise control. Standard sound transmission class (STC) is 30. Additional noise control specifications can be met at the behest of the customer or designer and must be noted in advance. Eco-friendly: Large Sliding Doors are manufactured using natural wood fibers, no formaldehyde, or toxic chemicals, is created using less energy than any other core material with little or no waste. The torsion box structure of Large Sliding Door’s Sing door core is 100% renewable (nature-grown) clean fiber and/or recycled material. Warranty: Large Sliding Door manufactured doors are structurally guaranteed for 10 years under normal conditions and can be guaranteed up to 50 years.